Filmmaker Werner Herzog travels to Antarctica to capture its landscape’s rarely seen beauty on film. BEFORE: The next two films in the documentary chain deal with adventure and exploration. I begin with Werner Herzog’s Encounters at the End of the World. Another Herzog doc will be coming up later in this chain. AFTER: Encounters at the End of the World is unlike any other documentary I’ve seen. A traditional narrative, for the most part, is forgone. Instead, the focus is placed solely on the visuals of Antarctica. And my, how gorgeous those visuals are. The underwater and above water photography is at the level of Planet Earth. It’s incredible how breathtaking a vast expanse of snow and ice can be. What’s not done so well is the narrative that Herzog imposes on the documentary. 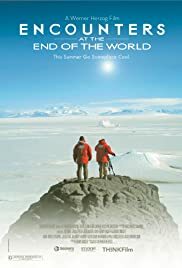 His mission, which he states quite clearly, is not about penguins like so many other Antarctica films are about, but rather the human nature. Herzog is looking for the answers to some big questions, but he doesn’t quite achieve his goal. The responses he receives are captivating but they bring us no further to understanding why we do what we do. The beauty of the Antarctic landscape and the contrasting view of McMurdo Station leave you with images that you’ll remember but the questions pose leave much to be desired.